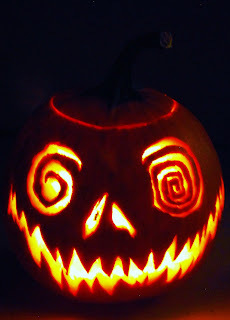 You know it's October when you come home from work to find a Jack O' Lantern burning cheerily away on your kitchen counter wafting that aroma into the air that only burning pumpkins have! Boy, does that always bring back a bunch of childhood memories! Amanda loves October - loves, loves, loves it - and she couldn't wait any longer to carve one of the two pumpkins that she got when she and our friend Amy went apple-picking a couple of weeks ago. I told her there was no way it would last until Halloween but she figures she'll have time to carve plenty more before now and then. I just bet she will! Speaking of October and aromas in the air, I baked a couple of apple crisps yesterday afternoon as I needed to use the apples I had before they went bad plus it sounded good even though I didn't have any vanilla ice cream or whipped cream in the house to go along with it. 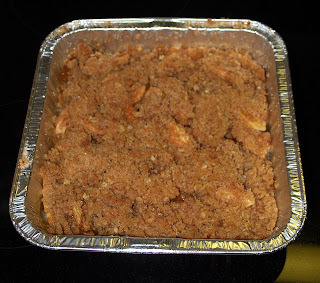 When my friend Andrew came over to remove the air-conditioners from the windows for me and my bad back, the apple crisp had just come out of the oven and he got the first bowl as a thank you for his help. This picture is of a second smaller batch that I made to maybe take to work with me later today - maybe! Speaking of work where I've been putting in some extra-extra hours lately, I'm actually going to take a few days off this coming weekend and next week so that Amanda and I, along with her friend Darci, can head back down to Baltimore to attend the way-past-due funeral of Edgar Allan Poe. I'm sure that sounds downright strange but I guess by now you folks should be used to that with me! Poe's Funeral is the crowning event of Baltimore's Poe Bicentennial Celebration with two services being held on Sunday - one at 12:30 and one at 4:30. Actor John Astin, best known as Gomez in the TV series The Addams Family, will be hosting both services which promise to be quite interesting! We'll be attending the 4:30 service but plan to definitely be on hand for the 11:30 funeral procession which will bring Poe's body from his former Amity Street home to Westminster Hall via an antique horse-drawn hearse. Unfortunately no pictures will be allowed at the funeral but I'll be sure to get some of the procession. In addition to Poe's funeral, we have another reason to be heading back down to Baltimore and that's so Amanda can attend a book-signing on Saturday at The Children's Bookstore by her favorite illustrator and inspiration for much of her own art - Gris Grimly. 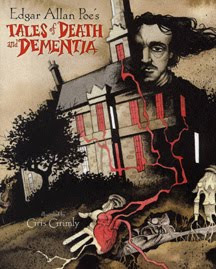 Grimly will be autographing his latest work, Edgar Allan Poe's Tales of Death and Dementia, so its only appropriate that he be in Baltimore not only for the book-signing but also as a speaker at Poe's funeral. It's been said that "Grimly's deliciously malevolent illustrations are the perfect compliment to Poe's stories" and I'd have to say that I couldn't agree more. Amanda is, of course, both excited and nervous at the prospect of meeting Mr. Grimly and no doubt getting her hands on an autographed copy of his newest work. 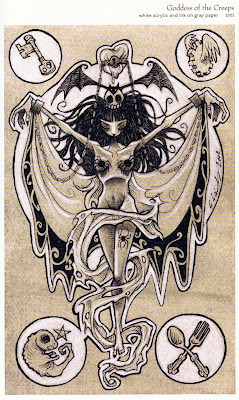 Speaking of Gris Grimly's work, this is the piece that Amanda would like to have done as a tattoo someday. It's called Goddess of the Creeps - appropriately! I'm not so sure it's something that I would want as a tattoo as the detail work would have to be really, really painful but I guess I wouldn't be surprised to someday see Amanda sporting this - once she's over the age of 18 and can pay for it herself! Amanda's friend, Sami, has been trying to encourage Amanda to draw something to give to Mr. Grimly at the book-signing but she's just not sure what to draw and worried that he wouldn't like it. The kid has no confidence in her own talent sometimes even though one of her teachers, after seeing her Poe portrait, asked her to do several more paintings of American authors for Writer's Ink, an anthology of stories and artwork from students at NFA. Personally I think she should do something but she doesn't think he'd want it so I'm guessing she won't. I have to give her credit for wanting to respect other people's "space" but I still think she should do something even if it was small. Ah, but what do I know? Anyhow, there will be a lot more to this trip than just a jaunt down to Baltimore but I'll fill you in on that later in the week. For now I'm going to go debate some more as to whether or not that second apple crisp is going to make its way into work with me or not! It's a fine design, Linda. That sounds like such a totally fun trip and I know Amanda will be in heaven. Maybe if we can convince her that it isn't "pushy" to give someone a handmade gift. A copy of her "Poe" drawing on card stock as a "thank you" would be very appropriate. Please send recipe for Apple Crisp. I just did pumpkin pies from scratch with pumpkins we picked up at the local Pumpkin Patch and Corn maze. 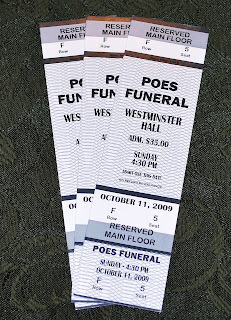 The Poe Funeral sounds like an amazing time. I'm so happy that you have time to enjoy yourself. I'm assuming that you're not working your part time job anymore? You just made me hungry for Apple Crisp btw. 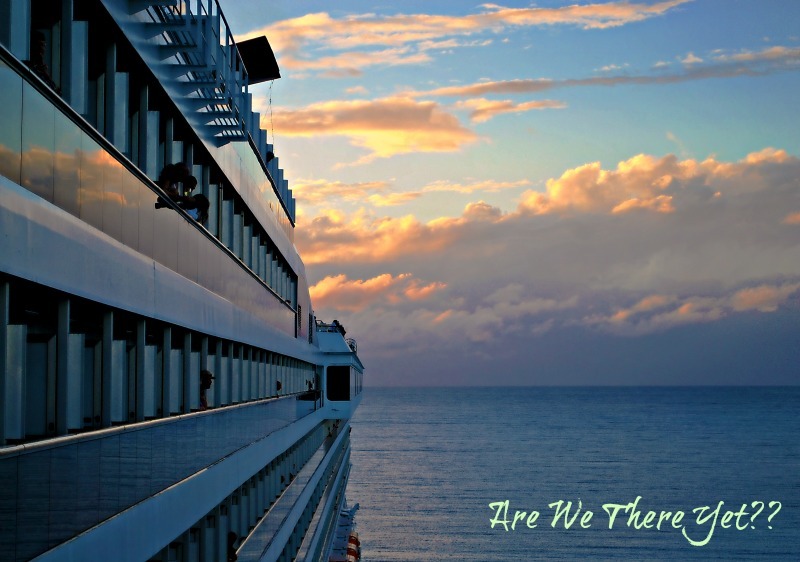 Sounds like a fascinating October you have planned!